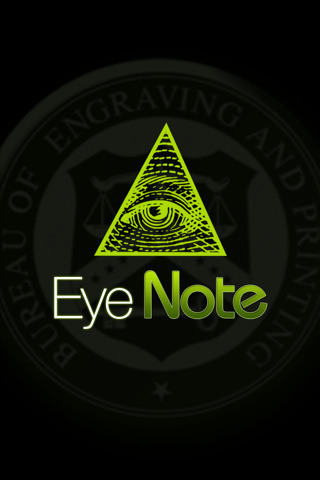 The Bureau of Engraving and Printing will announce today that they have developed EyeNote,™ an app for iOS devices (iPhone, iPod Touch, iPad) that will help the assist the blind and visually impaired determine the value of the U.S. currency they are holding. According to the press release received this morning, EyeNote uses image recognition technology to determine a note’s denomination. The mobile device’s camera requires 51 percent of a note’s scanned image, front or back, to process. In a matter of seconds, EyeNote can provide an audible or vibrating response, and can denominate all Federal Reserve notes issued since 1996. The app will be updated as new notes are issued. “Research indicates that more than 100,000 blind and visually impaired individuals currently own an Apple iPhone,” according to the BEP. It seems the BEP needs to fix the grammar a bit. On my iPhone 4, the LED flash was turned on, I positioned a $20 note reverse in front of the camera, tapped the display, and the camera sound played as it took the picture. After a few seconds, a woman’s voice told me that it saw the back of the $20 note. I found a $10 and $50 note. Both were identified on both sides with no problems. After passing those tests, I tried the only $1 note I had: one that was used as a chew toy by one of my dogs. No matter how I positioned the camera, the app could not identify the note. While the app is impressive it would have been amazing if the app could have identified my torn note! It is very rare that an app’s first release is as impressive as EyeNote. However, it is not perfect. The opening screen needs to either have a voice over or larger text. The instruction text needs work and the controls need to be better explained. I grade this app MS68+*. Yes, it gets the plus rating for being excellent in what it does and the star because once you figure out the controls, it has great eye appeal. I am very impressed with the effort. I hope the BEP fixes the issues I found. Click on any picture to see a larger version. Use your browser’s back button to return to the blog page.